The Encyclopedia of DNA Elements (ENCODE) Consortium is an international collaboration of research groups funded by the National Human Genome Research Institute (NHGRI). 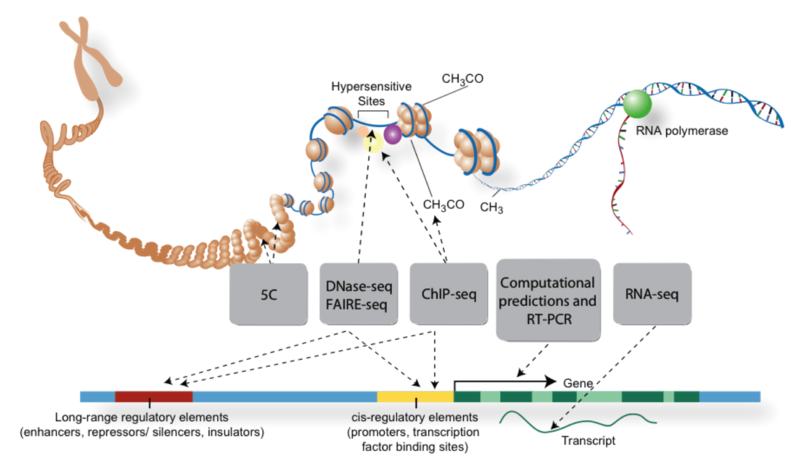 The goal of ENCODE is to build a comprehensive parts list of functional elements in the human genome, including elements that act at the protein and RNA levels, and regulatory elements that control cells and circumstances in which a gene is active. WARNING: This is a test site. Data and tools here are under construction, have not been quality reviewed, and are subject to change at any time. For high-quality reviewed annotations on our production server, visit http://encodeproject.org. WARNING: This is our preview site. This website is a weekly mirror of our internal development server for public access. Data and tools here are under construction, have not been quality reviewed, and are subject to change at any time. We provide this site for early access, with the warning that it is less available and stable than our public site. For high-quality reviewed annotations on our production server, visit http://encodeproject.org. To search for ENCODE data related to your area of interest and set up a browser view, use the UCSC Experiment Matrix or Track Search tool (Advanced features). The Experiment List (Human) and Experiment List (Mouse) links provide comprehensive listings of ENCODE data that is released or in preparation. Early access to pre-release ENCODE data is provided at http://genome-preview.ucsc.edu. If you would like to receive notifications of ENCODE data releases and related news by email, subscribe to the encode-announce mailing list. For more information about how to access this data, see the free online OpenHelix ENCODE tutorial. All ENCODE data is freely available for download and analysis. However, before publishing research that uses ENCODE data, please read the ENCODE Data Release Policy, which places some restrictions on publication use of data for nine months following data release. Read more about ENCODE data at UCSC. Chromatin Interactions by 5C from ENCODE/Univ. Mass(Dekker): This track contains chromatin interaction data generated using the 5C (Chromatin Conformation Capture Carbon Copy) method by the ENCODE group (Dekker Lab) at the University of Massachusetts. The track shows significant looping interactions between transcriptional start sites (TSS) and distal regulatory elements in the context of the 44 ENCODE pilot regions spanning 1% of the human genome. ENCODE Pilot Regions: This track depicts the 44 target regions covering 1% of the human genome defined for the ENCODE pilot project. The hg19 coordinates for these regions were obtained using liftOver from the hg18 track. Replication Timing by Repli-chip from ENCODE/FSU: This track shows genome-wide assessment of DNA replication timing in 7 cell types (3 stem cell, HeLa, IMR90, lymphoblastoid and BG02ES) using NimbleGen tiling CGH microarrays. Gene Annotations from ENCODE/GENCODE Version 11: This version features 79% coverage of genes by manual annotation. It is based on the Ensembl 66 (Feb 2012) and Vega 46 (Jan 2012) gene predictions and curation. Transcription Factor Binding Sites by ChIP-seq from ENCODE/HAIB (Release 2): This release contains 68 new experiments, including 1 new cell line (HUVEC) and 20 new antibodies. There are also data corrections and new validation datasets (shRNA knockdown). CTCF Binding Sites by ChIP-seq from ENCODE/University of Washington (Release 3): This release contains 3 additional experiments in H7ES, NHLF, and HFF cell types. DNaseI Hypersensitivity by Digital DNaseI from ENCODE/University of Washington (Release 4): This release contains 11 new experiments across 9 new cell types. Histone Modifications by ChIP-seq from ENCODE/Broad Institute (Release 2): This release contains 64 new experiments including 1 new cell line (Dnd41) and 10 new antibodies, and 3 datasets have additional data. Open Chromatin by DNaseI HS from ENCODE/Duke (Release 2): This release provides data in additional cell lines (Colo29, CD4+, ECC-1, H7ES, HEK293T, 3 IPS lines derived from fibroblasts, MCF-7, Medullo, RWPE1, T-47D), higher-quality data for the K562 cell line, and additional data corrections and replacements. Affymetrix Exon Array from ENCODE/Duke (Release 3): This track displays human tissue microarray data in 56 cell lines. The RNA extracted from these cells were also analyzed by DNaseI hypersensitivity (Duke DNaseI HS track), FAIRE (UNC FAIRE track) and ChIP-seq (UTA TFBS) by the ENCODE OpenChromatin group. RNA-seq from ENCODE/Caltech (Release 3): Signal files for all experiments have been replaced with more accurate data. Earlier versions can still be accessed for download only. Transcription Factor Binding Sites by ChIP-seq from ENCODE/PSU: This track shows occupancy of genomic DNA by 5 transcription factors (CTCF, GATA1, GATA2, PAX5, TAL1) and Pol2 as determined by ChIP-seq in 6 erythroid and other blood cell types (CH12, MEL, G1E, megakaryocyte, erythroblast, G1E-ER4). Long RNA-seq from ENCODE/Cold Spring Harbor Lab: This track contains information about mouse RNAs (> 200 nucleotides in length) in 17 different tissues, as obtained by Illumina squencing. These two companion tracks survey cis-regulatory elements in the mouse genome. ChIP-seq was used to localize binding of Pol2, CTCF, and p300 factors and to profile 7 chromatin modification in 20 different mouse (C57Bl/6) tissues, primary cells, and cell lines. Release 2 of these tracks adds 87 new experiments. Replication Timing by Repli-seq from ENCODE/University of Washington: This track shows genome-wide assessment of DNA replication timing in 15 cell lines as identified by the sequencing-based "Repli-seq" method. Replication timing is known to be an important feature for epigenetic control of gene expression that usually operates at a higher-order level than at the level of specific genes. RNA-seq from ENCODE/HAIB: This track displays RNA-seq alignments and graphs of signal enrichment for 9 cell lines, in various treatment protocols. Estimates of transcript abundance are provided for download. Gene Annotations from ENCODE/GENCODE Version 10: This version of the GENCODE Genes track features 77% coverage of genes by manual annotation. It corresponds to the Ensembl 65 (Dec 2011) and Vega 45 (Oct 2011) gene predictions and curation. DNaseI Digital Genomic Footprinting from ENCODE/University of Washington (Release 3): Release 3 includes experiments in 19 additional cell types. Histone Modifications by ChIP-seq from ENCODE/University of Washington (Release 3): This release adds the H7-hESC cell type and another replicate for the GM12865 experiment. CTCF Binding Sites by ChIP-seq from ENCODE/University of Washington (Release 2): Release 2 includes experiments in 15 additional cell lines. Small RNA-seq from ENCODE/Cold Spring Harbor Lab (Release 2): This release adds 10 new cell lines (A549, AG04450, BJ, H1-hESC, HeLa-S3, HepG2, HUVEC, MCF-7, NHEK, and SK-N-SH_RA), a new displayed view (Contigs), and two new download files (GENCODE Predicted Exons and a Protocol Document). RNA-seq from ENCODE/Caltech (Release 2): Data was reprocessed with a newer mapping algorithm (labeled V2). Additional download files of gene, transcript, and exon expression levels are now provided. Genotype (CNV and SNP) by Illumina 1MDuo and CBS from ENCODE/HudsonAlpha (Release 2): This release contains data corrections to GM12878 and astrocyte experiments. Three new tracks and one track update were released on the hg19 genome browser: Read more. ENCODE data are covered by the ENCODE Consortium Data Release Policy.